Title: Grain in the Midway. Description: A surprise grain train roars through the Midway Intermodal Terminal, with the help of two leased units. Description: Three engines shut down and separated from the main body of their consist. 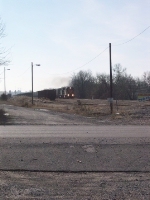 Engines were parked just south of CP N Byrd on the BNSF Fort Worth Sub. Lead engine was BNSF 7748, a GE ES44DC, with the new "Swoosh" logo. Definitely the highlight of my day. Description: A pair of SD40-2's lead a southbound into Tennessee Yard on a cool Febuary evening. Description: An unexpected rock train jets off from waiting at the signal bridge past the highway. Description: Westbounds are quite rare on this line. Shot at 22nd St. Description: In the midst of other FURX's that were once stored here in the T yard. Description: Many of these bring back specific memories of "back in the day", which was only a few years ago now. They did look better back then, though, but sitting for over a year in the middle of nowhere takes its toll. Description: One of the many FURX SD40-2s that are in the T yard. Description: 50 Green SD40s with various units sit at NRE @ Silvis Illinois.